The Tristan Bates Theatre, currently home to a revival of Martin Sherman’s Passing By, is a curiously anachronistic fixture in the West End. It is one of the few theatres in London that could possibly lay claim to that most American of terms – ‘off-Broadway’. Unlike the Arcola, the Southwark Playhouse and even the Almeida, the Tristan Bates Theatre is genuinely situated in the heart of the West End and surrounded by some of the biggest theatres in the country. It also has a bracingly uncommercial sensibility that sets it apart from other non-traditional West End theatres; the Donmar Warehouse by way of comparision, barely two minutes away, can hardly lay claim to such a perspective when the cheapest of their friend’s packages clocks in at £350. It is a theatre that feels, and attempts to be, dedicated to playwriting and acting. The black box space and the, presumably, limited budgets leads to a much reduced directorial hand and a focus on the play and performance. 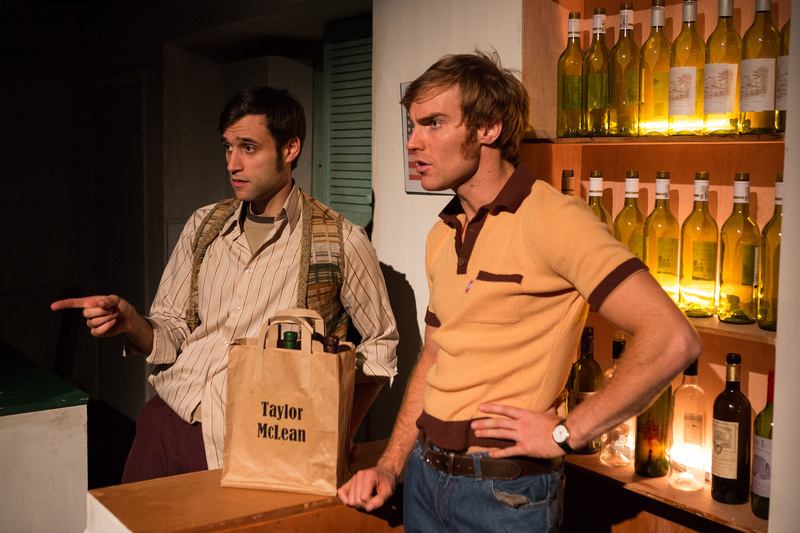 As a result the Tristan Bates is an ideal home for Sherman’s 1972 two-hander about two gay men coming together in 1970’s New York. Passing By is a play that rests on the naturalism of its dialogue and the interplay between the two lead characters. It has been quite a long time since I have seen a production that allows the play to seem so unencumbered; in part this is because the majority of the play is set in one location but credit must also go to Andrew Keates unfussy direction. Intentionally or not Keates has managed to capture something of the uninhibited freedom of the golden age of American cinema; Robert Altman’s Nashville immediately springs to mind or perhaps more appropriately given its New York setting, the criminally underrated Klute. In these 1970’s films, as in Sherman’s play, the audience gets the sense that they are capturing snippets of a life, fading in and out of conversations whose intangibility only serves to reinforce the grounding in reality. There are one or two scenes that are set outside of Toby’s apartment but Keates makes no real attempt to change the setting; a couple of seats and the whir and flicker of a projector is enough to take us into a cinema, a sideboard repositioned tells us that we are now in a wine-shop. These small touches allow the play to keep up its natural pace and the audience doesn’t get sidetracked by the immaterial. That is not to say that the set is not worthy of mention. If anything it operates as a third actor; it is the most superb evocation of an apartment in the heart of 1970’s New York. Every element feels steeped in the period without running into pastiche. It is not just pleasing that this has been achieved, it is an essential element of bring the period to life as the naturalistic nature of the play dictates. Many West End productions are so hyper-real in their execution that they begin to drift into the surreal; what is being seen is so perfectly realised that one cannot escape the sense that it must be a fake. With Philip Lindley’s set (and also Philippa Batt’s wonderful costuming) there is no self-conscious showiness in the design, it feels instead just like a lived-in apartment from which the fourth wall really has been removed. However the quality of a naturalistic play will ultimately fall on the performances of the actors. Rik Makarem, as Toby, has the not insubstantial task of taking on the role that was first played by Simon Callow, whilst James Cartwright is Simon. Both performances are excellent and the strength rests on the bond that has been created between the two. The play is noticeably weaker in the rare scenes that are not played as duologues; Toby plays the ‘morning-after’ scene as broad farce, which seems to be for the audiences benefit rather than as naturally suiting his character and as a result feels out of kilter with the rest of the play. Similarly Cartwright has a long, drunken monologue which is a notable weak point in the play. Here the fault must rest with Sherman, as it is overlong and gives the actor very little to work with; there is no-one to bounce off and does little to shine a light on either character. In the aftermath Cartwright and Makarem have to work hard to rekindle the plays spark. When the two are together there is a real tenderness in performance that is difficult to achieve without a strong bond of trust between the actors and faith placed in each other’s performance. The play is full of small moments of truth that can only have come out of the rehearsal process; they are those moments when you can distil the entire essence, the truth, of a relationship at a fixed point in time into a single touch or glance. At a surface level it is Toby, the artis, that is anxious, high-strung, and emotional, whereas Simon, the Olympic diver, is bold, playful and more traditionally masculine. However it is Toby that raises the stakes by making Simon steal the wine or threaten not to see him again. It is a gesture towards the hidden depths of Toby’s personality and reveals that Simon’s apparent confidence is more of a charade than he is willing to admit. The scenes where Simon joins Toby after being diagnosed with Hepatitis reveals the true nature of their relationship; Simon proves to be a challenging patient and Toby discovers a certain paternal element, which could be what gives him the reserves of strength necessary to rekindle his stalled artistic career. In showing us this developing relationship and the changing of status, Makarem and Cartwright give us performances that are not defined by bold gestures; there feels a real attempt to move away from ‘camp’ and ‘macho’ stereotypes. There is an innocence to this relationship that perhaps reflects the fact that it was written in 1972, at a time gay culture was delicately placed between the idealism of 1960’s liberalisation and the hard-fought battles of the 1970’s; when the gay movement begin to clearly define its position in relation to the prevailing culture of society and certain ‘gay’ identities began to emerge. The immediately noticeable element of the play that cannot pass unremarked is the fact that it was written in a pre-AIDS age. The audience cannot help but take the foreshadowing of the next two decades and as a result imbue the play with a tragic poignancy. We know that Simon and Toby survived this battle but would they survive the war that was to come? It is a devastating thought that casts even the lightest of lines with a heavy burden, and it is again to Makarem and Cartwright’s credit that they manage to remove any hint of this dramatic irony from the performance. They are living in the moment and they deliver characters that face the fear of hepatitis in its own terms, and with no knowing glances to the audience. It is refreshing to see an explicitly gay play that does not mention Aids, or even make much reference to the wider societal prejudice of the time. It is a play about love and relationships, and sexuality is perhaps the least important element of it. It is difficult to imagine, even today, a gay play that avoids these sizable elephants in the room. Some may argue that they shouldn’t avoid these topics but one can legitimately ask how society can move past the stigma that is attached if we always discuss gay characters within the parameters of disease and discrimination? Martin Sherman’s Passing By is a reminder of the belief in the equality between humans. His beautifully naturalistic dialogue, backed up by strong performances and an evocative set, may be innocent, and at a times a touch naïve, but it is a powerful reminder of the capacity all humans share to love and to care for others.